Is letting children play with automatic rifles really about gun safety? Santa Rosa's South Park neighborhood saw a big police presence Saturday. In a park named for Martin Luther King Jr. and at an event coordinating with Gang Prevention Awareness Week, the police displayed a fully automatic assault rifle, high-powered weaponry and an armored vehicle. Photographs of small children playing with a machine gun at the South Park Summer Day & Night Festival have circulated, causing alarm. The poor judgment by police has been questioned by festival attendees and others who have seen the photographs. The Peace & Justice Center of Sonoma County advocates for nonviolent solutions. We understand that we cannot create a more peaceful world without first imagining it, and our children can't imagine it by going to their local park to fondle weapons. When questioned, Police Chief Tom Schwedhelm responded in the Press Democrat, "Whether you like it or not, our police have guns," adding, "We encourage our cops to get out of the car and interact with the community." But no one is protesting police patrolling with guns in their holsters. 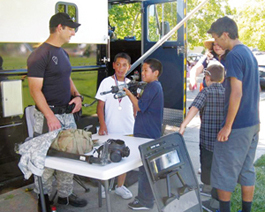 There's a police presence at the Wednesday Night Market without officers letting children handle automatic rifles or a SWAT vehicle parked at Fourth and Mendocino. Those wishing to normalize the control of others commonly divert the discussion from the real issue so that it's soon forgotten. The heavy police presence also reinforced the message that South Park residents need to be protected from each other, thereby fostering distrust and negative stereotypes. The festival celebrated the South Park Youth Center, self-described as being "in one of the highest crime neighborhoods." But two years ago, the Press Democrat quoted the beat sergeant as saying there are no statistics to back up this perception. I have gone door to door in South Park doing economic-justice outreach, and have found anger and despair. Residents have received the message from Wall Street and Washington, D.C., that the welfare of struggling communities will continue to erode while wealth will be protected by tax codes and police departments. Theft by elites will go unchallenged, while resistance by the have-nots could be met with the same automatic weapons and armed vehicles once welcomed into the community. It is time for our communities to work together to reduce our need for violent solutions. We can begin by changing the violent messages we internalize and pass on to our children. Susan Lamont is center coordinator for the Peace & Justice Center of Sonoma County. She is also a founding member of Take Back the Wealth, a group sponsored by the Peace and Justice Center currently doing community organizing in the South Park neighborhood.